When Judy and Peter Copses bought the lot next door to their modern hilltop home just north of Beverly Hills, they did it to prevent a McMansion from bearing down on them in the future. Instead, they wanted to transform the land into a garden. Not that they didn’t already have one. 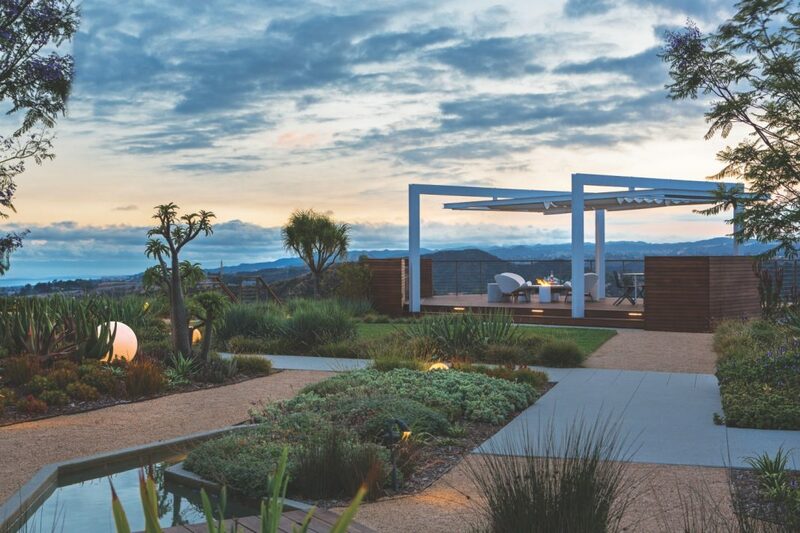 Two years earlier, they’d hired landscape architect Mark Tessier to create outdoor areas for cooking, dining, lounging, and conversation that turned out more practical and striking than imagined. The challenge now was to use the additional space and make an exceptional garden even better. The Copseses—he’s an executive at a private equity firm and she’s the president of the Los Angeles Swim Club—demolished the neighboring house and pool, then asked Tessier to link the properties via a green space that celebrates the local climate. Because their three sons had become competitive swimmers, they also requested a regulation-size lap pool. There was just one hitch: For the practice pool, city code required some sort of structure on the lot. But since no minimum size was stipulated, Tessier came up with the clever idea to move the family’s guesthouse 250 feet to function as the new pool house. With the old accessory building out of the way, Tessier, who also designs landscaping for affordable housing and mixed-use projects, set out to maximize the panoramic vista that ranges from the San Fernando Valley to the ocean. While he was at it, he sought to shield the exposed site from the sun. His clients approved. “We needed more coverage, so we could stay outside and not fry to death,” Judy says. Three interlocking glass-tile-topped tables can be reconfigured according to the size of mealtime gatherings on the dining patio. 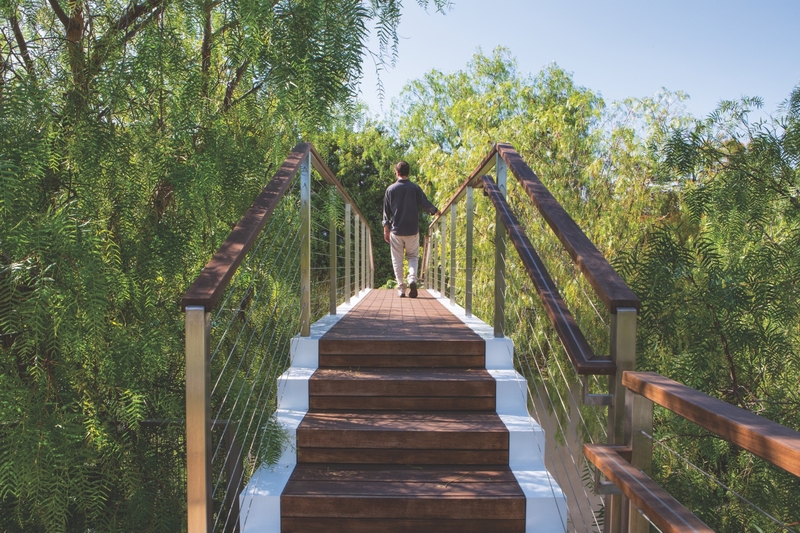 Tessier stretched the driveway from one lot to the other, enlarged and reconfigured the motor court, and planted a grove of African sumacs to provide a natural shade canopy and frame a new deck on the cliff’s edge. 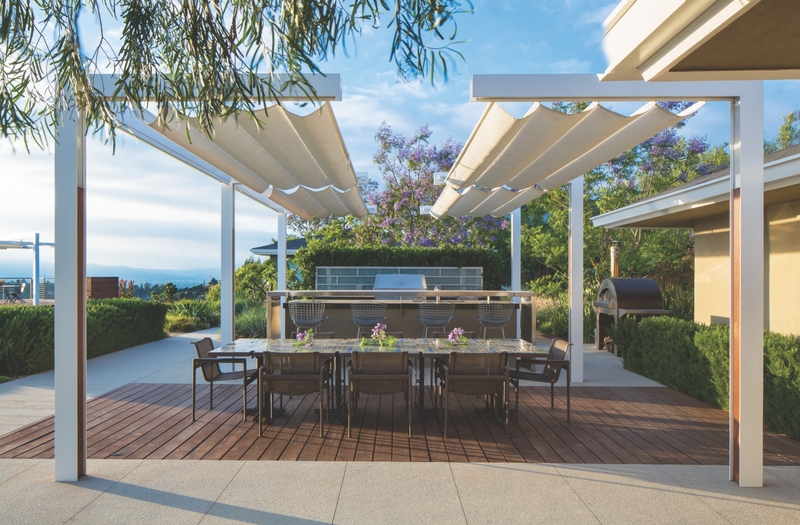 Tables and chairs beneath retractable awnings draw the eye through the trees and toward that scenic perch, but before you can reach the deck, meandering paths of concrete and crushed gravel offer other rewards. A stepped fountain refreshes with the sight and sound of burbling water. 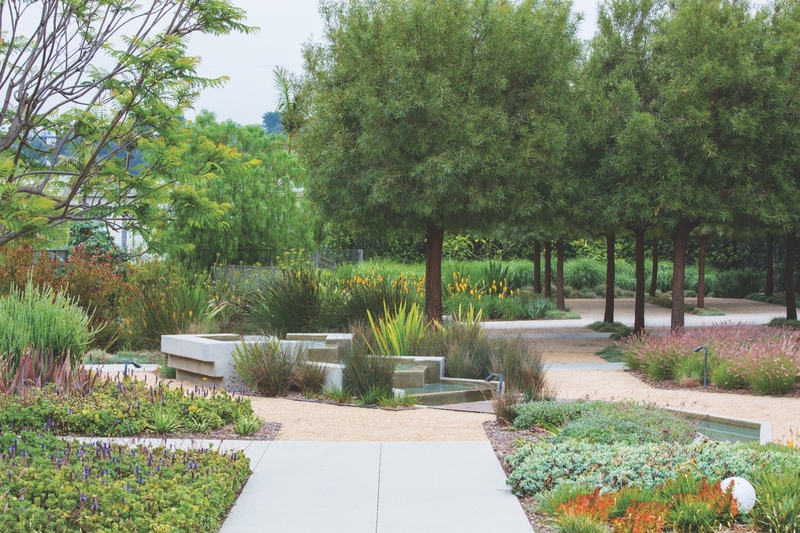 Drifts of exotic drought-tolerant plantings—including fan aloes, squid agaves, and Mexican lilies—seduce with different forms and textures. At night, light globes nestled amid the ground cover produce an ethereal glow. The new bridge over the driveway connects the adjacent lots, making it possible to walk around the entire garden without having to backtrack.